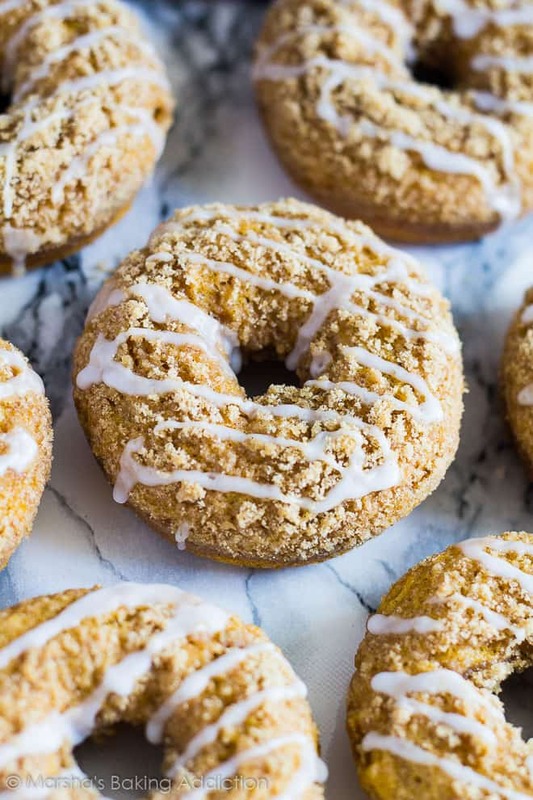 Baked Pumpkin Streusel Doughnuts – Deliciously moist and fluffy spiced pumpkin doughnuts that are BAKED, not fried, topped with a crunchy cinnamon streusel, and drizzled with a sweet glaze! I love baking doughnuts, they are just so quick and simple to make. I love baking doughnuts rather than frying them; less mess, and much healthier. And if you haven’t noticed, I already have a few baked doughnut recipes on my blog! See my Baked Double Chocolate Orange Doughnuts, Baked Banana Bread Doughnuts, Pink Glazed Easter Doughnuts. 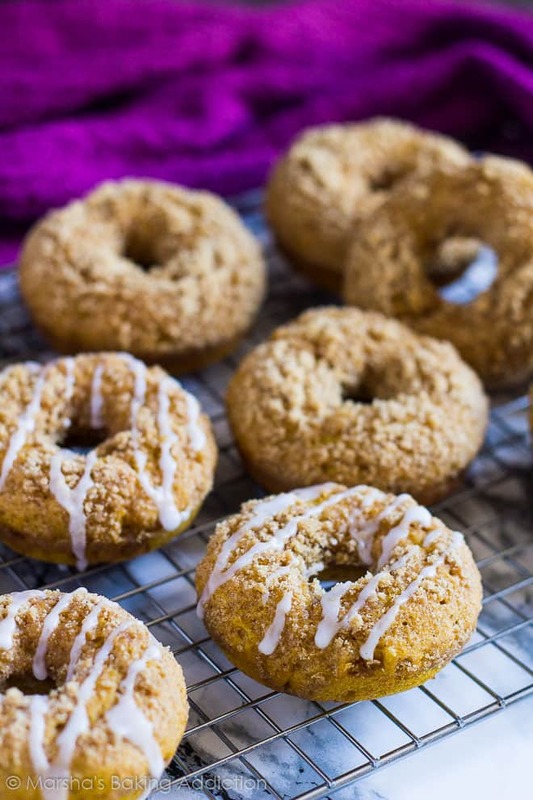 Today, I bring you my most deliciously moist and fluffy Baked Pumpkin Streusel Doughnuts! 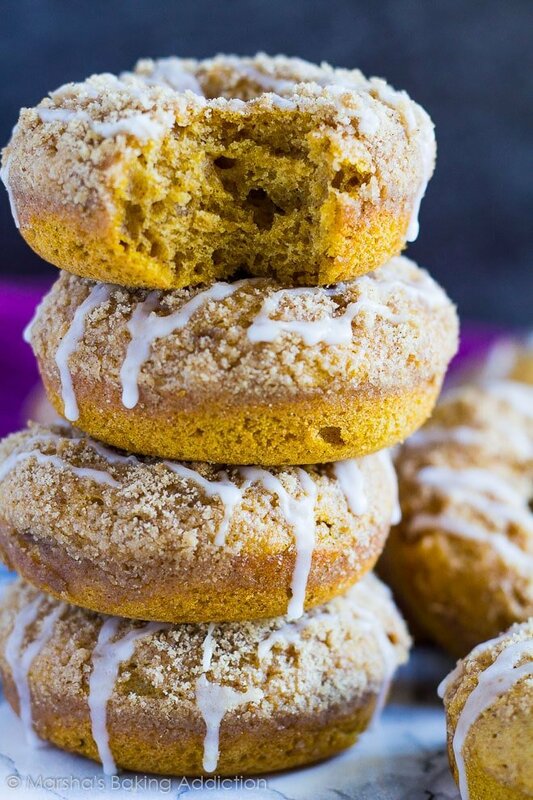 I absolutely love these pumpkin doughnuts. 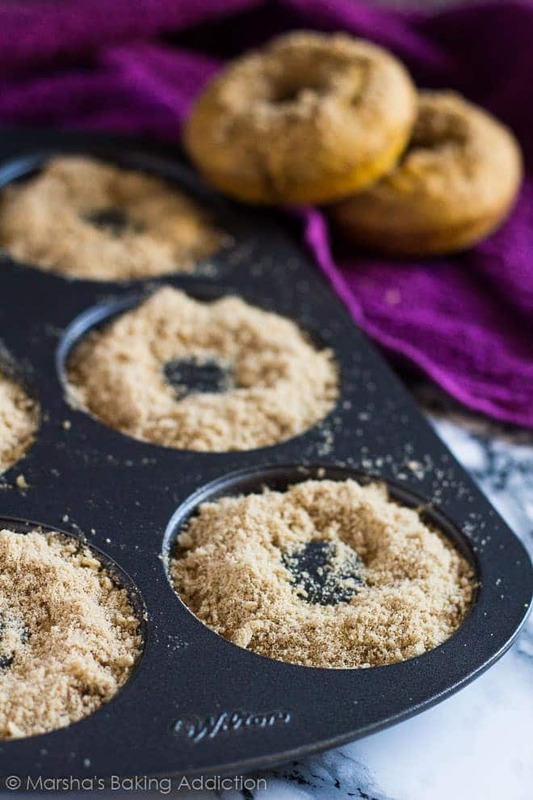 They are super quick and easy to make, they’re scrumptiously moist and fluffy, topped with a slightly crunchy cinnamon streusel, and the best part? They are BAKED, not fried! 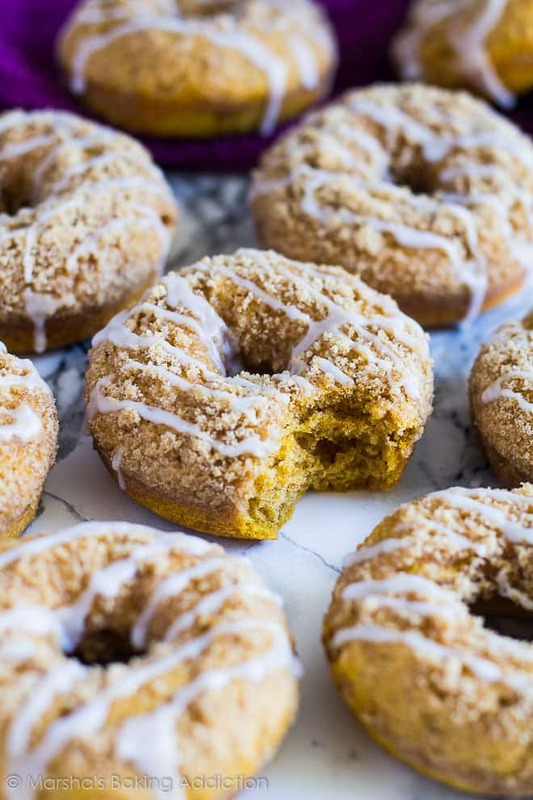 These Baked Pumpkin Doughnuts would make the perfect autumn breakfast or snack. I can just imagine being curled up on the sofa, covered in a blanket, watching a scary film (because Halloween! ), and devouring one of these doughnuts. To make the doughnuts, simply whisk together the dry ingredients in one bowl, and the wet ingredients in another. Combine the two mixtures together, and spoon the batter into a greased doughnut pan. 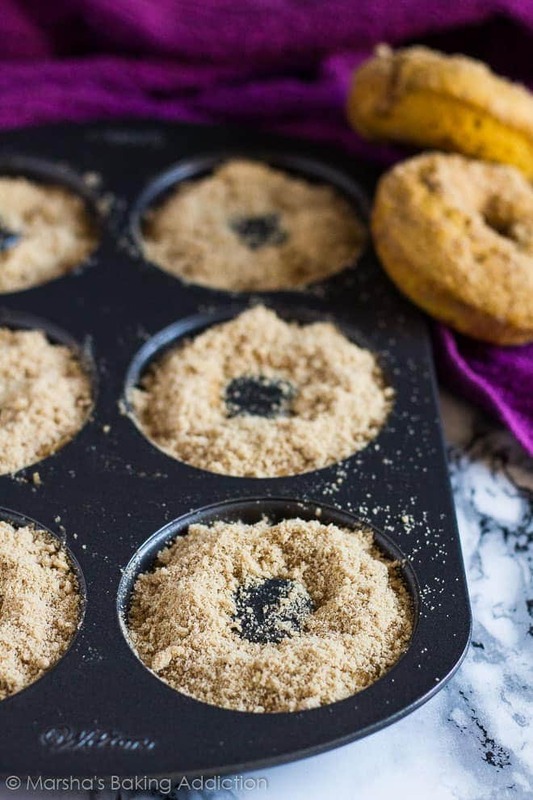 Using a fork, mix together the streusel ingredients until the mixture resembles coarse crumbs, then sprinkle the streusel over the doughnut batter. You’ll want to bake them at 180C/350F/Gas 4 for about 5 – 7 minutes. Drizzle with a sweet glaze. Enjoy warm, or store them, covered, at room temperature for up to 2 days. You can also freeze these doughnuts for up to 2 months. Be sure to thaw them overnight in the fridge! Try these delicious doughnuts next! 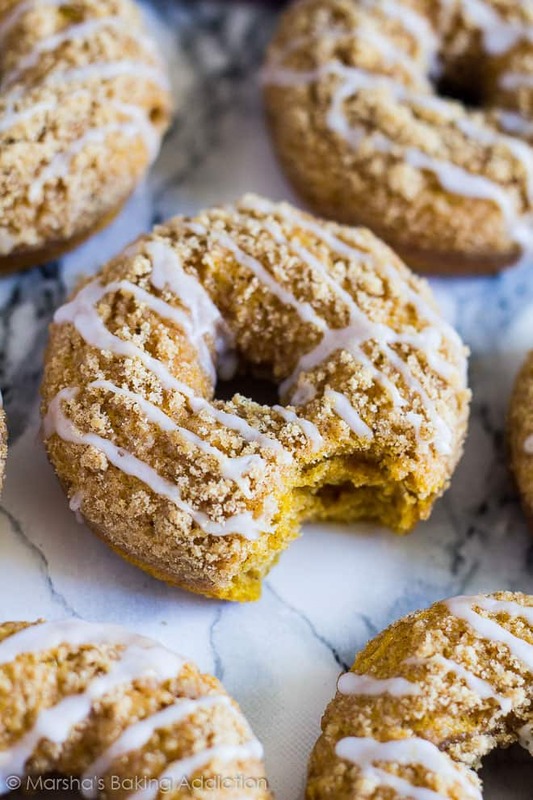 Deliciously moist and fluffy spiced pumpkin doughnuts that are BAKED, not fried, topped with a crunchy cinnamon streusel, and drizzled with a sweet glaze! Using a fork, mix together the butter, sugar, flour, and cinnamon until the mixture resembles coarse crumbs. Set aside. Whisk together the egg, sugar, yoghurt, melted butter, and pumpkin puree until combined. Pour the wet ingredients into the dry ingredients, and mix until just combined. Do not over-mix. The batter will be quite thick. Spoon the batter into the prepared doughnut pan and smooth out. You could also use a piping bag to pipe the batter into the pan; much quicker and less mess! Sprinkle a generous amount of streusel over each doughnut. Bake for 10 - 12 minutes or until a toothpick inserted comes out clean. Allow to cool for 5 minutes before transferring them to a wire rack to cool, or eat warm! Whisk together the icing sugar and water until smooth. It should be fairly thick and runny. Drizzle over the cooled doughnuts. Leftover doughnuts can stored, covered, at room temperature for up to 2 days. Doughnuts freeze well for up to 2 months. Thaw overnight in the fridge before serving. Looks sooooo yummy! Pinned it and totally plan on making these! Baked donuts are the only type of donuts I’ll eat anymore, so these are right up my alley!! Absolutely LOVE that cinnamon streusel topping and sweet glaze! Fall flavored perfection up in here! Cheers, Marsha! Okay, watching a scary movie with a BIG plate of these donuts is all that I need right now! Also, Halloween is always the best reason around! 😉 I totally know and love all of your doughnut (yep, I had to spell it this way the second time around) recipes. This gorgeous pumpkin streusel one looks like yet another winner to add to the books! Hope you’re having an awesome start to the week, Marsha! 🙂 Pinned! Pumpkin & streusel????? Pinned! I’m totally with you on the baked doughnut part too. If I can get my hands on doughnuts without having to face the fear of hot oil it’s a total win in my book. Baked doughnuts vs fried doughnuts – baked always wins hands down. 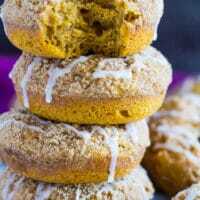 These pumpkin doughnuts look delightful especially with that strudel! 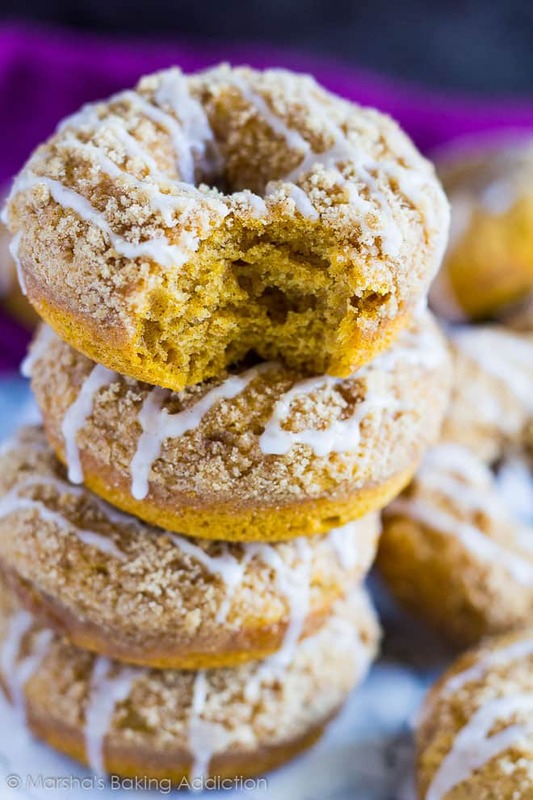 Streusel+pumpkin+doughnut= one happy me! These look perfect, Marsha! Could you also use a muffin tin for this?? 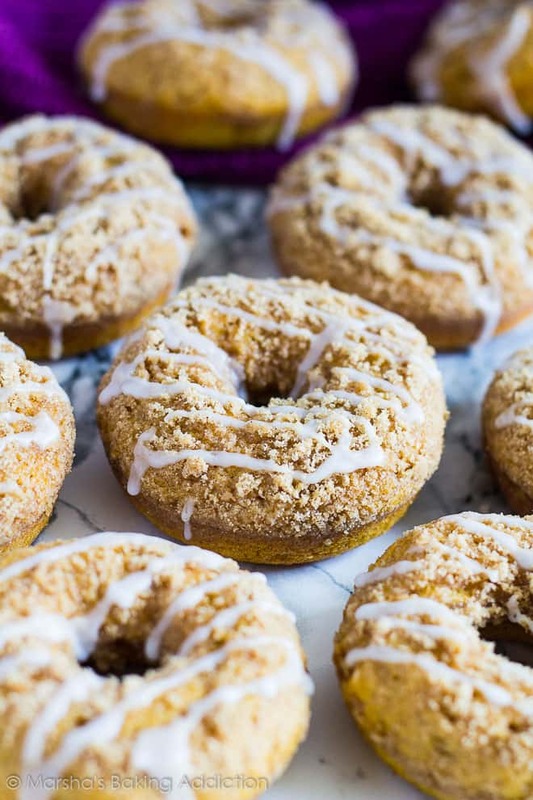 Streusel + donut together sounds HEAVENLY. I can’t say I’ve ever had it before but looks absolutely perfect! Love pumpkin!!! Your doughnuts look amazing and thanks so much for sharing them with us!